Emma marched in the house from the school bus one afternoon and plopped down on the couch. She was visibly upset in a way that was unusual. 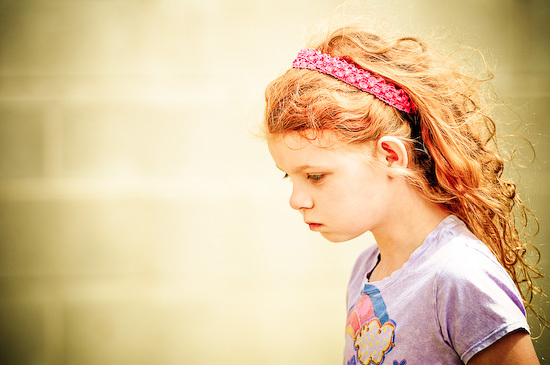 Sometimes she has behaviors that are impulsive and sensory based, so that it seems like she might be upset, even when she’s not. Thank God now I can communicate with her to find out! I sat down with the ipad. Now this is something that I’ve heard many times from Emma. It was one of the very first things she wanted me to know when she started communicating. For so long, everyone had treated her as if she didn’t understand much (including me too many times to count). Why wouldn’t she want to tell me how smart she was over and over!? My heart just sank. And then Emma did something that she doesn’t usually do, and it really broke my heart. She just started bawling. She whaled and covered her face with her arms, mouth wide open, tears falling from her eyes. She wasn’t able to tell me who this kid was. It can’t be easy for kids like Emma. They work SO hard to accomplish what the world wants them to in order to “fit in”. None of those kids will ever know how hard she works to keep her body calm, communicate, learn and all the while have the most sincere desire to be a part of a social scene – to belong. The “R” word makes me cringe when I hear it these days. I guess before I had a child who was diagnosed with mental retardation, I might have never given it a thought. Or maybe I would have. The thing is, that I don’t remember hearing it slapped across the mouth of every child, teenager and adult as I do now! 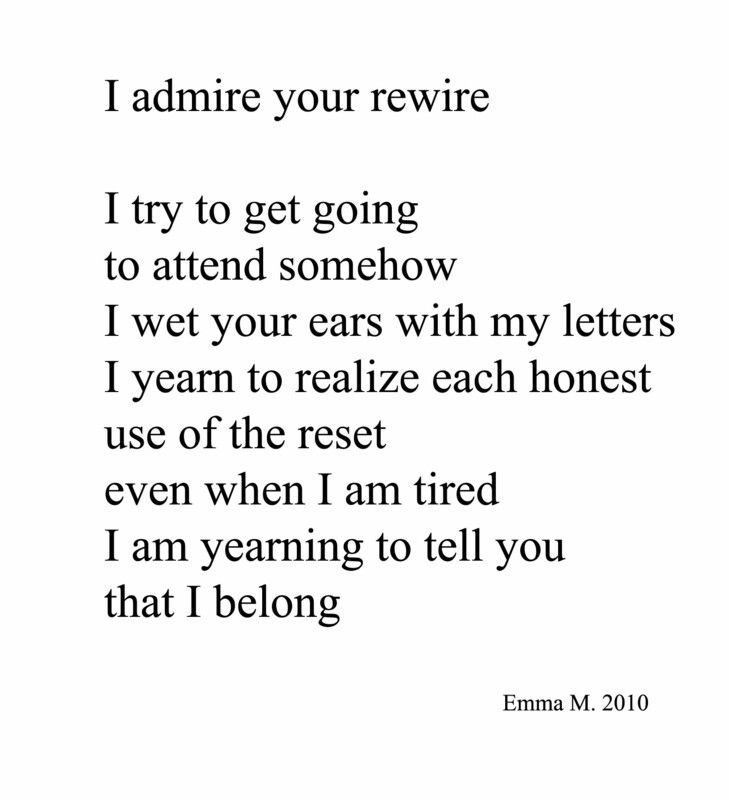 There happens to be another “R” word that I’ve seen Emma type out many times : Rewire. She uses it to talk about personality, or rather the changing of personality. She tells me about how she works hard to rewire herself and also about how she thinks people should also rewire their minds – change their perceptions about autism and disabilities in general. There’s that old saying that sticks and stones can break my bones, but words will never hurt me. Well, I’m not so sure about that. Words are very powerful, even when thrown around in a casual conversation between friends. We’ve probably ALL been guilty of using the “R” word. But that word causes pain. It brought many tears and negative self-perceptions to my child. I think it’s important for us to stand up for those who may not be able to stand up, or speak, or behave in the “typical” fashion. 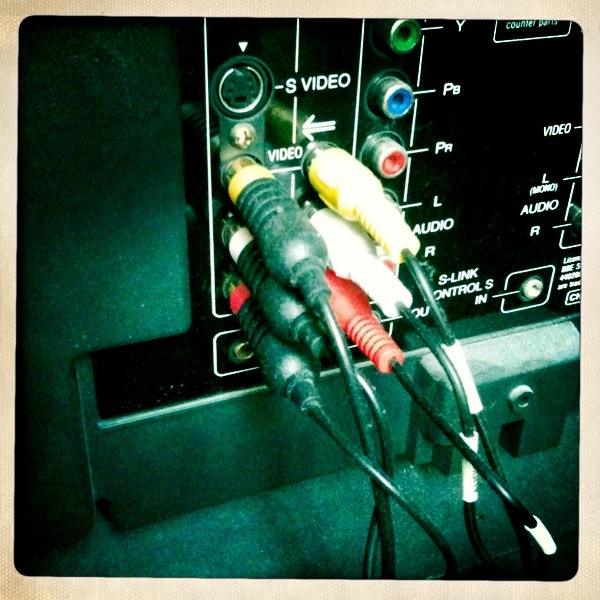 Our world needs a little “rewiring” of our minds to better understand and be sensitive to those with disabilities. Here is a poem that Emma typed out last year and I think it’s fitting. She picked out the picture to go with it, too! I know it’s hard to change a slang and especially one that everybody is saying, but please JUST SAY NO to the “R” word!!! There is a scripture in Psalms that proclaims “I am fearfully and wonderfully made”. We are, each of us, uniquely wonderful; a life released at birth to give joy and love to those around us. I wept while reading of Emma’s pain. We have all learned much from her struggle and her profound wisdom. Many people don’t have the gift of seeing the beauty in the world the way Emma does. Many still don’t have the absolute honor of seeing the beauty that Emma & kids like her add to the world. Words do hurt, as a kid, I was called many names, probably the most scathing was AIDS, it still hurts 20yrs later. My girl, I am so sorry someone was so insensitive. And here you are, a poet and a thinker!. And your feelings were hurt by someone’s ignorance. I would give you a big hug if I could. I would go down to your class and tell that teacher and principal that they need to teach all of the students to eradicate such an ugly word! And I am glad that you can cry, for tears help you to heal from sorrow. Oscar Wilde wrote: “In sorrow there is Holy ground.” Everyone feels sorrow, but it is hard to go through it. For Emma, you are special. You have a gift inside of you that nobody else in the world has! It is the you-ness of you! My girl, there is no one else in the world like you! And that special place is in your heart and your soul. The next time you hear someone behave so badly, please tell yourself that you are special, and that you are loved. And that you are a smart girl. A smart special girl who is so dearly sweetly loved. And she sure loves her grandma! Thank you so much for the kind words, Alexandra. I will def read this to Emma!